The latter does not seem to be adequately solving the problem of the former. With the coming of the New Year come all the resolutions: lose weight, exercise more, kick the bad habits and embrace the good habits. If one of your goals for 2012 is to lose weight, let me save you lot of unnecessary frustration regarding which diet to try. Let me tell you about the only one that actually works. If you take a close look at all of those diet books, diet gurus, and no-fail diet regimes on the market they all have one thing in common: They make you eat less. They may trick you into thinking that you can eat more because you are eliminating (choose one: fat, carbs, protein). But the truth is, you are eating less. It's simple math: 3,500 calories equals 1 pound. If you eat 3,500 more calories than you burn you gain 1 pound. If you eat 3,500 less calories than you burn you lose 1 pound. One 'goes on a diet', eating certain foods, not eating others, carefully monitoring every morsel. One loses the intended weight. The diet was a success! One 'goes off the diet'. One startes eating all the banned food, reverting back to previous habits, and promptly regains all the lost weight… and, usually, just a bit more. With my simple diet plan you have a much better chance of losing the weight for good. Here's how you can put them together for your own diet – to lose weight now and to keep it off forever. Take an honest look at what you eat. All of it, including the piece of candy you got at the bank and the bite of cake you had from your friend's dessert at lunch. Remember, this isn't rocket science, it's simple math. Now that you know what you eat, decide on how much weight you would like to lose…. and be reasonable. Don't set yourself up for failure. Let's say you want to lose 15 pounds by April 15. That's a bit aggressive, but still reasonable. Remember, you're keeping it off so no need to rush it…. And you didn't put it on overnight. To lose a pound per week you have to reduce your daily intake by about 500 calories – or work it off. Do you normally have 2 glasses of wine with dinner? Eliminate 1 for 100 calories. Do you normally put 2oz of cheese in your omelet? Use 1oz and save 100 calories. Eliminate 1 tbs of butter or oil each day – 100 calories. Eat some yogurt. Buy plain yogurt and add your own fruit. Studies have shown that eating yogurt helps digestion and can increase weight loss. If you usually eat 6oz of whatever meat, eat 5oz… or even 5.5oz. Measure your food…. 1/4 cup of Basmati rice doesn't look like much for 1 person before it's cooked. But it is…. And the difference between 1/4 cup and 1/3 cup is about 60 calories. Hungry for a snack? Make yourself a cup of hot green tea while you think about it. And buy a bag of almonds and walnuts in the shell. While your tea brews, crack a couple. It's a nice healthy snack and having to crack and pick out the nut meats keeps you from eating too many. And don't forget to have your treats…. Like that square of dark chocolate for dessert. And now, the secret weapon: exercise. Once again: don't set yourself up for failure. Don't decide you're going to the gym for an hour every day when you haven't been in 3 years. You won't do it. Instead, decide not to park so close to the office or mall or whatever. A 10 minute walk will take care of 50 calories. Do that twice and you're down 100. Decide to do some weight-training…. Muscle burns more calories than fat. Put two people on the couch for a movie. The one with more muscle will burn more calories just sitting there doing nothing. You don't have to go to the gym for that either. In less than 10 minutes you could do 30 walking lunges for the lower body, 12 push-ups for the upper body and maybe some sit-ups for the old gut. Do that 3 times a week…. You may not lose anything the first week…. Maybe not even the second. But, you start having more energy, the weight does start coming off, the clothes fit better…. Heck, maybe you even feel like going to the gym…. In doing all this you're making small, but hopefully permanent lifestyle changes. Try not to set yourself up to fail by pushing yourself to do what you know you won't. And eat soup. It fills you up and it's good for you. Cut the vegetables into large chunks. If you are using celery tops, use them all, including the leaves. Put chicken, vegetables, herbs and water in soup pot or Dutch oven. Cover, bring to a boil, reduce heat and simmer for an hour if using breasts, 2 or 3 hours if using a whole chicken. When done, strain stock, discarding vegetables and reserving chicken. Chill stock and remove fat. Refrigerate chicken until making soup. Bring stock to a boil over medium heat. Cut carrots in half, the long way then thinly slice. 1/8" (3 cm). Add to stock. Thinly slice celery, add to stock. Chop onion, add to stock. Add herbs, cover, reduce heat and simmer. Cut the chicken into small pieces and add to soup.The soup and vegetables should simmer for 30 minutes. Add the noodles towards the end of the cooking time and simmer until done. Taste and adjust, adding water, stock, salt or chicken base/stock cubes as needed. Serve. Perfect, Katie, perfect. You are spot on. Let’s hope all of us will be a little more conscious of what we are eating this new year. And, the soup looks great. I just got a text from my trainer – back to the gym at 5.45 tomorrow !!! Never have truer words been spoken Katie. Here’s to a healthy 2012! I have 2 pounds to lose by March. I have just started to increase my exercise and try to cut back on the food I have been indulging in too much. Bread, cheese, cake. Cutting out or at least back on these 3 things and replacing them with 0% fat fromage frais and more fresh fruit always works. And chicken soup! Great idea and I love it! Happy & Healthy New Year! You’re so right about soup. I have soup for my meal at least 4 times a week. It really does help. Chicken soup is my all time favorite!! All good tips to keep fit and healthy in 2012. I agree it is food and exercise. manningroad – I need a trainer. Puppies don’t count. Val – to a healthy 2012!!! Jamie, fresh fruit is what I try for. I’ve been very bad – up 3 over the holidays…. time to get rid of it. Lydia, I could live on it…. Mon mari only occasionally. Fortunately, he makes his own lunch…. 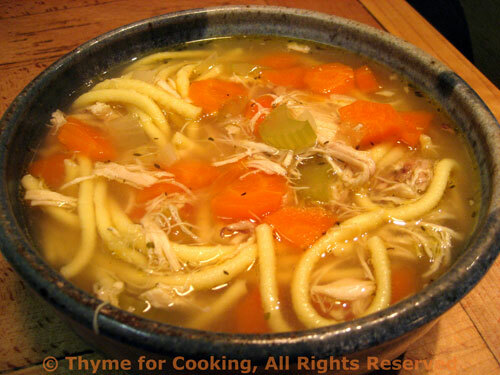 foodwanderings, chicken soup is always good – as is exercise. Chicken soup is easier! This is a great post Katie. A lot this we know already but we need to hear again and again and start doing it. Your soup looks delicious! I love soup in the winter time. I always feel like I am eating a lot too with all of the liquid. I love all of your hints and tips – they are all so true! All of those people selling January diet plans are NOT going to thank you for this post, Katie! Mmmmm, chicken noodle soup! Yes, please. Well said Katie! Your soup looks delicious too! Emily, I love soup, too… especially when it’s cold out! 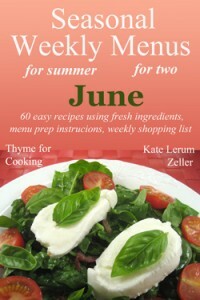 Delicious with chicken thighs, added thyme, bay leaf, and several carrots.